Three runways and a perimeter track. 1 x T2 hangar 14bay. 4 x Over Blister hangars. 6 x Extra Over Blisters hangars. 12 x dispersal pens ''B'' FCW4513. 23 x Frying pan aircraft dispersals. 1 x Old Watch Office (tb) [No number]. Continue to the small farm track ''Trickey Warren Lane'' and turn down the lane, drive to the end and park safely by large double gates. This is a good and safe place to park and walk from. There is a layout and short history of the airfield on a board there. It is possible to walk most if not all of the perimeter track. There are three large solar farms laid out on the airfield at this time they are half way through building them February 2015. I have started in the top right hand corner of the airfield. Red arrow - starting point. A US reconnaissance air photo showing the layout and the dispersed sites. 66, 126, 131, 154, 165, 234, 306, 312, 313, 316, 504, 610, 616 squadrons flew from here. 302 and 316 squadron flew from here. Wellington of the Research Flight from RAE Farnborough. 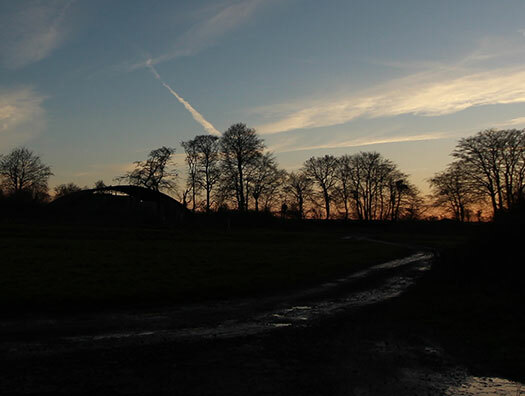 Here were two huts, one a Nissen hut and the other was a wooden hut. 162 Wing Command Station Intelligence & Briefing Room (t) and a fighter pen. (n) Nissen hut of the type that was here. This I think this was an Elsan toilet. This has now been removed. Elsan's were a portable toilet. Here we have a bucket emptying platform. Its a place where an Elsan bucket can be tipped (emptied) and then placed over the right hand side and the flush pulled and the bucket is cleaned out. We found this actually on one of the dispersed sites here this last visit in Feb 2015. Electrical cabinet. This is now been removed. I would think this came from the days when this was a government radio listening station and pat of that period. Composite Signals Organisation Station. Composite Signals Organisation Station (CSOS) Culmhead. GCHQ Scarborough, how it may have looked. 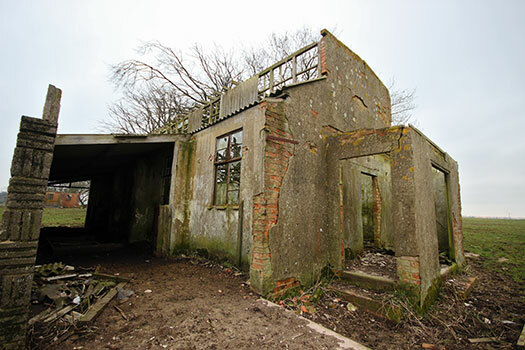 The farm was requestioned in 1940 when there was a need for fighter airfields in the S/W of England. The S/E had many fighter airfields but the S/W was not thought of as a battle ground until the German army over ran the whole of northern France. With the bombing of the West Country from airfields in Normandy and Brittany, a need was seen that the S/W should have better air cover. Screw Picket. by the tree stump. I thought for years this was a screw picket for barbed wire but know I think they were screw tie downs to hold the aircraft down in windy conditions. By 1941 a three runways 150ft wide with a perimeter track 50ft wide. Opened on the first of August 1941 probably in a sea of mud. How aircraft are tied down. I think they are aircraft tie down screw picket. Fighter airfields of this period had protective pens for their fighters. Here there were twelve in four groups of three and each pen held two fighters of the Hurricane size or two Blenheim fighter bombers. 21 Guard & Fire Party (tb) [12404/41]. 15 Fire Tender House (tb) [12410/41]. This is a Guard House & Fire Party and a Fire Tender Shed at RAF Honeybourne. This could be the sort of fire tender for the airfield buildings rather than for than for aircraft crashes. The first two pillboxes and perimeter track on the left. The pillboxes are an unusual seven sided design. There are two here (a third I believe in the hedge not found) and a three further west. They have small rifle embrasures and a larger machine gun embrasure that some have steel plates and some either have had them removed or were not fitted. Plan of the pillboxes here. The top two had splinter walls inside (the red T shape) and the others three further down do not. 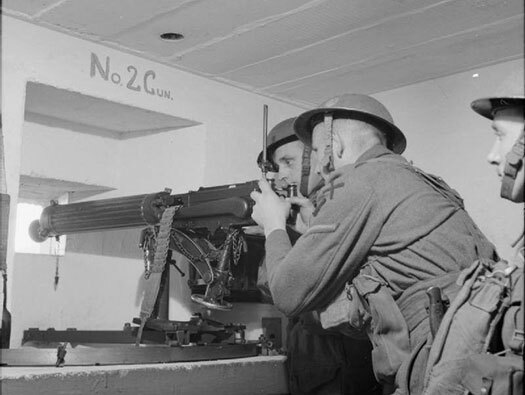 Bren gun in a pill box. Several screw pickets on the roof. 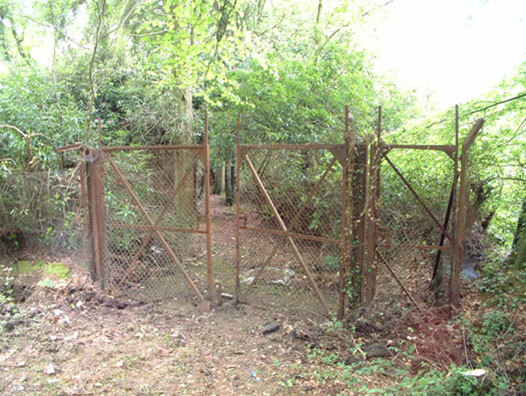 The airfield defence was carried out by the Somerset Light Infantry and then later on by the RAF Regiment. A good friend of the Somerset reenactors. 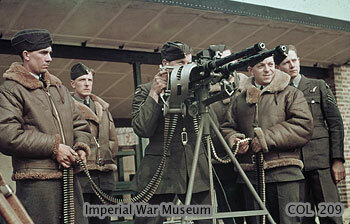 The machine gun embrasures covers the airfield. After the German attacks on Europe many of them were paratroops landing on airfields, so the best defence is to place pillboxes all around the perimeter facing the landing ground. The machine guns covering the airfield. One machine gun embrasure and one rifle embrasure. Very few of the huts would have been built so a lot of tents would have been used. Machine gun embrasure with a double steel flap. Note the hook to hold open the flaps. To the north many dispersed sites living sites and communal sites where officers, sergeants mess's and the mens institute. 19 Gas Clothing Store (tb) [12409/41]. Gas Clothing Store and in front a latrine (which I cannot find on the plans). The tin shed is a farm add on. The airfield started out as RAF Church Stanton. 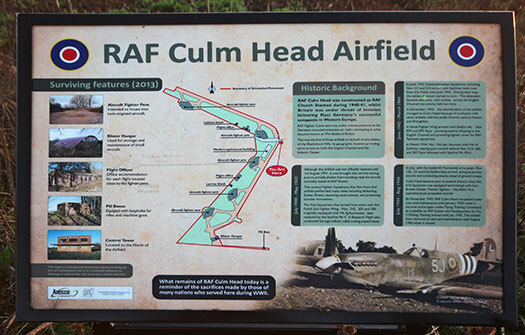 The name was changed because other airfields have ''Church'' in their names so it was changed to RAF Culmhead. A Blister hangar was placed by each three sets of fighter pens (a flight) and a T2 hangar was placed in a small depression on the west side. Blister hangars were used for first line servicing and the T2 hangar for larger repairs and servicing. British MKVII Brown Gas Cape. Blister hangar with canvas curtains to try and keep out bad weather. The internal fittings are from its days as a farm. May have looked like this. 18 Gas Defence Centre (tb) [12408/41]. If the airfield had been attacked by a gas attack, something the British government thought might happen. 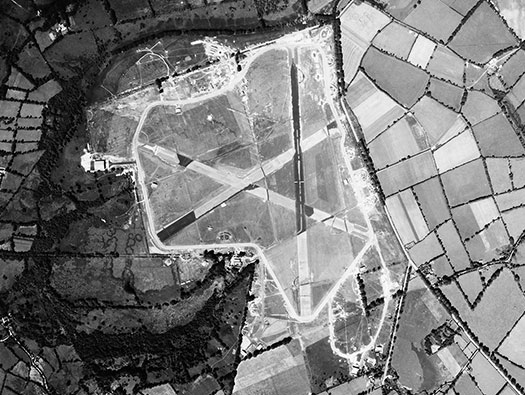 Gas Defence Centres and Gas Decontamination centres were sighted on the airfield and on a prominent dispersed site to treat airmen and women for contamination. I can try and say which squadrons came and went but all this information is in any book that is written about airfields in Britain. Squadrons often only stayed a few months and were moved on. But for quite a while the Polish Wing arrived with No.316 (Warsaw) and No.302 (Poznan) squadrons. Then the Czechs came with 313 and then 312 both with Spitfires. A [12408/41] at RAF Rougham. 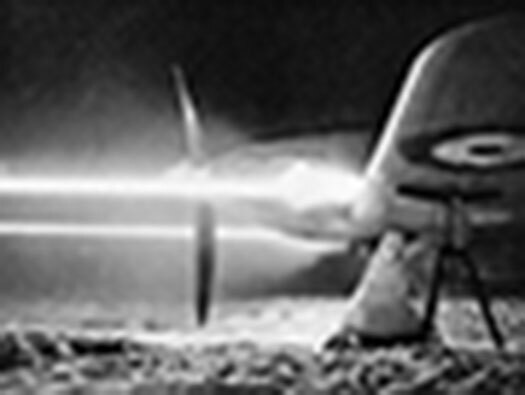 After the Battle of Britain Fighter Command went from defence to attack. That meant that squadrons on the south coast flew offensive strikes across the channel to France. Also they gave give cover to daylight raids by RAF and USAAF bombers. Cherbourg, Brest, St Nazaire and Le Havre were their main target that were in the range of day fighters at the time. Plan the green squares are Blast Shelters and the blue a. Emergency Water Supply..
24 Main Workshop (n) [12774/41]. All that remains is this mound. Main workshop in (n) Nissen type hutting. 31 Technical Latrines (WAAF) (tb) [9026/41]. This set of latrines was probably for the WAAF's that worked in the Parachute Store behind it. A nice wash stand inside. 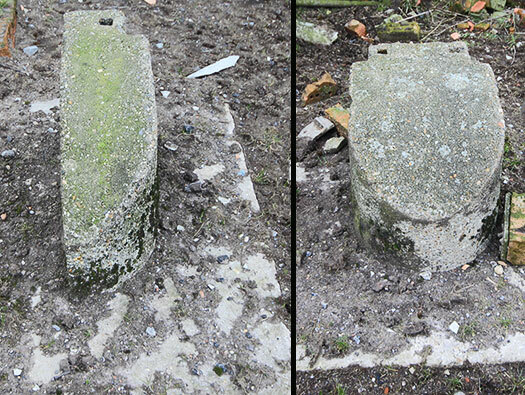 Latrines were often left as the rest of an airfield disintegrated so the farm labourers could use them. Sewage Site in the valley to the north of the airfield. The gates have now been removed 2015 but the posts remain. 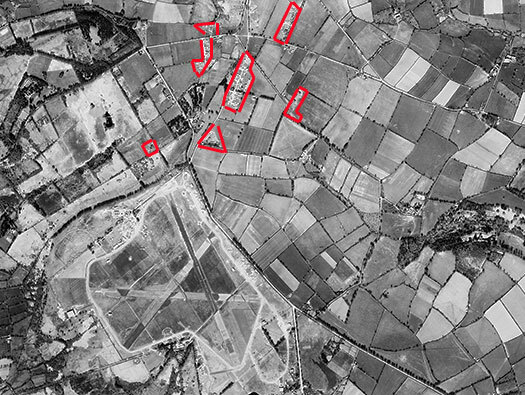 One thing these modern airfields had was a full sewage system, here there are two Sludge Drying Beds [2432/40?] and the rotating Percolating Filters [3349/36?] and 161 a Tool Shed (tb). The gates were a standard ministry design and a smaller side gate for the maintenance man to get through. The sewage site in the valley. Tool Shed at RAF Grove. Sludge Drying Beds at RAF Grove. 30 Parachute Store (tb) [11137/41]. This is where parachutes would be checked, repaired, aired, packed, stored and issued to flight crews. A 10825/42 a slightly different type parachute store. This is the front view, ignore the structure added to the left side this was added by the farmer. The view inside the parachute store. Inside a 11137/41 parachute store..
A 'Simplex' electrical fuse box. Note the windows can be pivoted open to allow a air to circulate through the parachutes to air and dry them. Putting the cords through elastic bands. 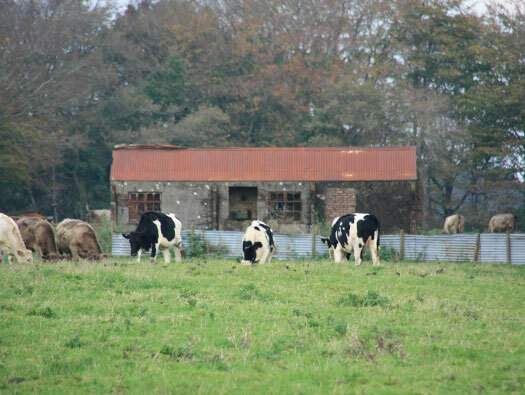 The roofing sheets fallen down are added post war by the farmer. KT RAF pilot parachute pack. Left - 26 M.T. Office a Nissen hut. Right - 25 M.T. four bay garage & workshop. Also an M.T. repair ramp. How the M.T. office may have looked. 12774/41 four bay M.T. garage this one is steel frame covered in asbestos sheeting. When the Polish left they were replaced in the summer of 1942 with a Czech 313 Squadron and later to make up the Czech Wing 312 Squadron. Tractor to tow planes and bombs. The two lock up bays. Repair bay with vehicle inspection pit. Left hand end door stop and a middle one. Wooden doors on a three bay MT garage. Vehicle inspection ramp. This is getting very damaged now. The tank on the right may have been the vehicle petrol tank and the water tank on the left may also have been used here on the camp. Water tank in an ablutions at RAF Membury. Vehicle petrol pump would have looked. Either side if this tree line were huts. A pill box in the distance. RAF code words for fighter strikes. Circus - bomber attacks with fighter escorts in the day time. Ramrod - short range bomber attacks to destroy ground targets. Ranger - freelance flights over enemy territory by units of any size. Rhubarb - operations when sections of fighters or fighter-bombers, taking full advantage of low cloud and poor visibility. Rodeo - fighter sweeps over enemy territory. Rover - armed reconnaissance flights with attacks on opportunity targets. 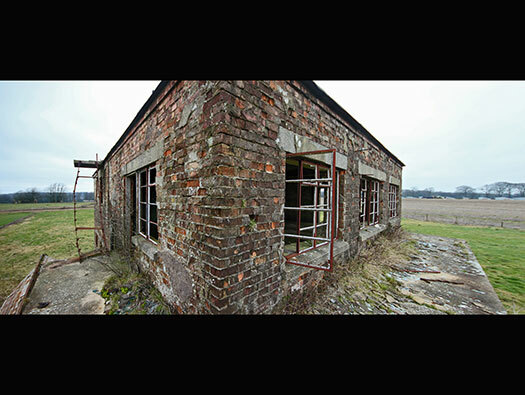 1a Battery Charging Building (Old Watch Office) (tb) [17658/40]. On early fighter stations with one or two squadron of fighters (average of 12 planes) a small Watch Office was enough to cope with their comings and goings. Later larger towers were built to control so much more lying. Hurricane with its battery starter trailer. Side view with the rear entrance and urinal (no WAAF's working here then). This Watch Office when superseded the building had a change of use to a battery charging building. Rear entrance, armoured door and urinal. Inside showing a bench to charge up aircraft batteries. RAF Bicester battery room today. Rear entrance with the armoured door to the pyrotechnic store. Salt glaze waste pipes used to carry telephone and teleprinter cables. Very pistols were used to fire flairs of different colours, green OK to land/take off. Red not to land /take off, etc. The small window is the Pyro store window. If fire and an explosion inside the store the steel door should hold it and the window could then break and dissipate the explosion. Battle of Britain condensation trails in the sky from high flying fighters. 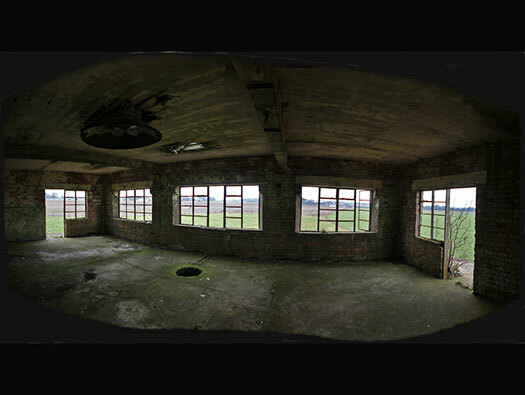 The control tower placed slightly forward of the old Watch Office and from the top floor you can see the whole of the airfield. The dark patch in the grass may be the Signal Square. RAF Old Sarum's signal square. Most airfields at this time did not have electric landing lights so a couple of Erks (lowest airmen life on an aerodrome) would have to go out with possibly a tractor & trailer with enough Goose Neck flairs and paraffin for the night. 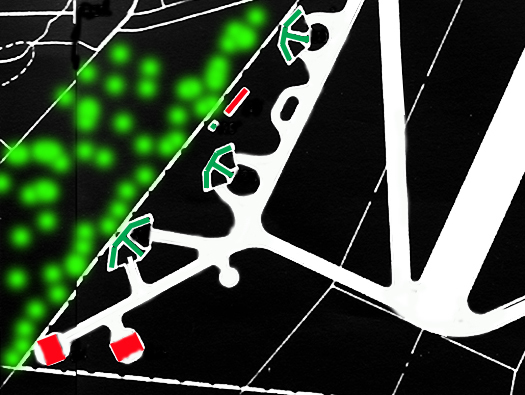 The flairs would be placed equidistant down both sides of the runway, filled with paraffin and the taper wick lit. When flying ended they would have to go back out and put out the flair by placing the cap over the wick putting out the flair. Then load up the trailer and come back. The Erks that did this would smell of paraffin as it would get into their clothing. Pooo. Goose neck flairs would have been stored here with the fuel and wicks. Paraffin with a wick in the spout and lit would run for quite a while. Now with the cap removed and you can see the wick. Goose Neck flair blowing in the wind.. Chance light shining down the runway. Another way of showing up which runway is in use. Perimeter track 50ft running right around the airfield. Perimeter tracks connected up all the runways to allow aircraft to go to the correct take off point allowing runways to stay clear for other aircraft to land or take off. Red - the arrow showing where we are. Hurricane on a perimeter track at night. 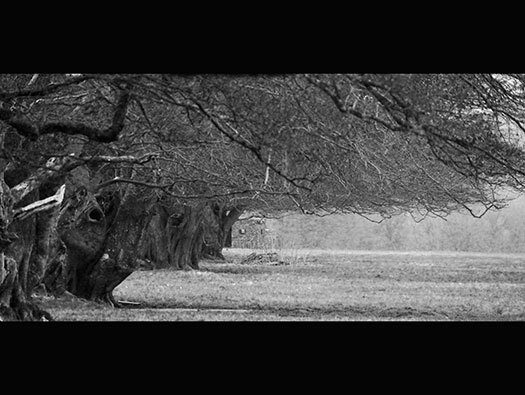 The tree line as a hedgerow grubbed out to allow huts to be placed under several of the large Beech trees. The hut base with rubble on it was 167 Barrack Block: Sergeants & other ranks (Defence unit) (l). Laing hut made of wooden frame covered plaster board and tar paper. 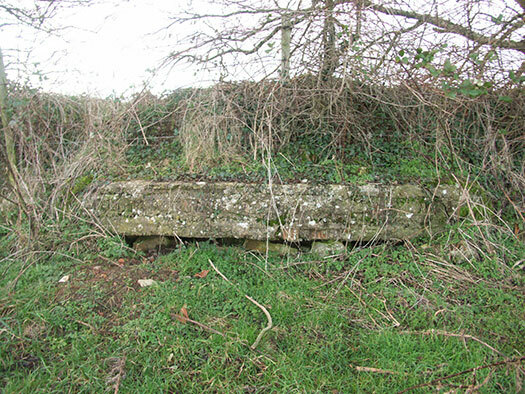 Base for a Laing Hut..
Somerset Light Infantry were the defence unit in the early years.. Tie down screw picket and stove base. Stove base and coal fire.. The screw pickets (red on plan) screwed into the ground to hold the aircraft in windy conditions. Three more pillboxes covering the North/Western side. The area of the pillboxes. No anti shrapnel wall inside these. Machine gun embrasure covering the airfield. The steel embrasure has two openings, one a rifle slot and the other which hooks up on the hook on the roof the machine gun embrasure. View to the next pillbox. A bit damaged but it is protected. Looking back, notice the control tower can still see right down here. Red square the we are now in. Area defence brick lined trench. There may have been more around here covering the dead ground. A concrete cover with TOP scratched into the concrete. 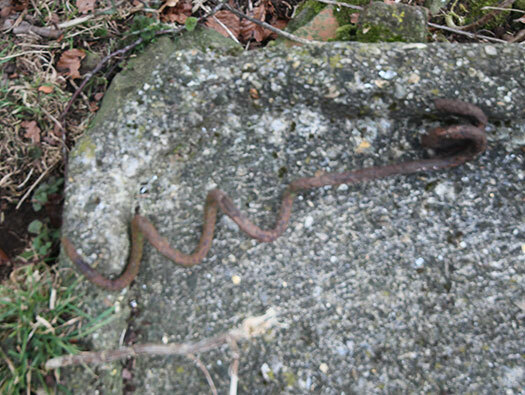 Found in the woods in November 2009. Motley made a range of defence weapons mountings and this is one type. A Motley Stalk AA machine gun mount. Motley AA .303 MG blue print. 13 Site of the T2 hangar Hangar [3669/42]. I have superimposed a T2 hangar onto the barn that is there now. Drain covers that ran across the front of the hangar in front of the door rails are still there. The track to the hangar base on the right and the perimeter track leading on. 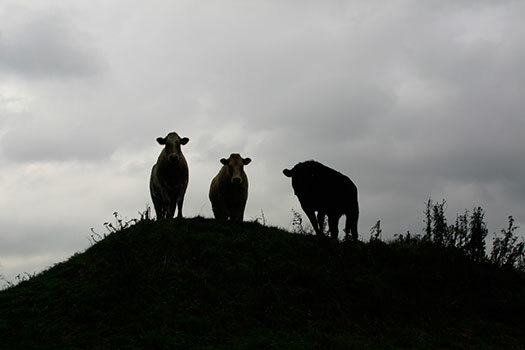 The next set of photos are taken along the hedgerow. Czech Spitfire under repair in a Blister hangar. Glass set onto the top of the wall to stop anybody getting in. January 2000 and a tree has grown through the wooden and barbed wire gate. 2015 and its still there but breaking up. 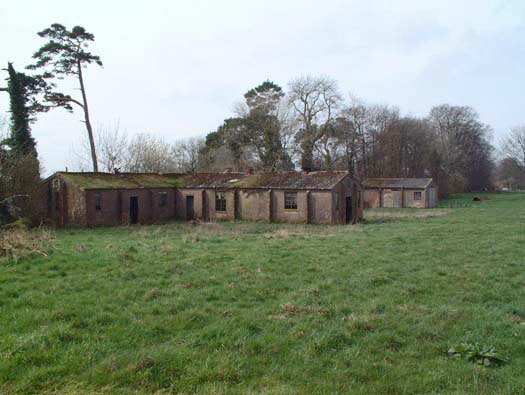 Two rows of Nissen hut barracks and a Latrine block. How they may have looked inside. A set of Latrines that was here. Set into the hedge made up as a defended slit trench. Defence position a sort of slit trench with bricks and block walls. I am not too sure if its damaged or actually never built purely as a pillbox?? It would fire straight down the runway. A very Grey day in February. Its still watching you. 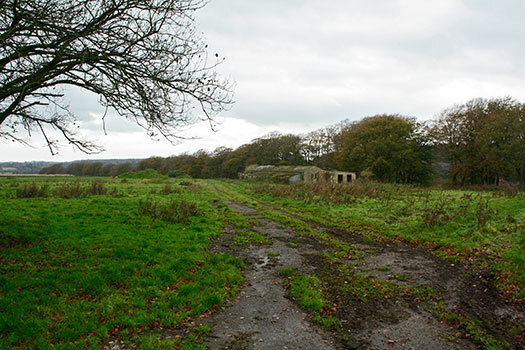 The bottom of the airfield on the west side with the defences along the left hand edge and the Control Tower is on the horizon in the middle of the picture. I have zoomed in on the Control Tower, if we can see it, they can see us. 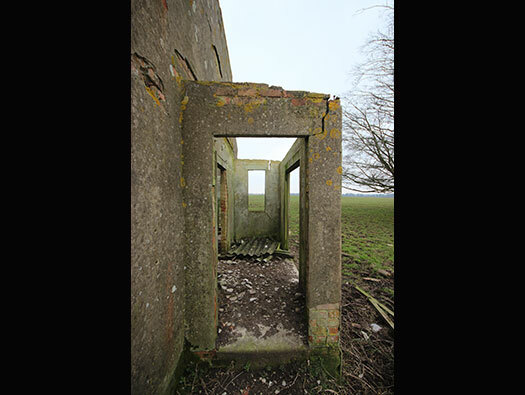 On one side this is a Pillbox yet on the other side it was a Quadrant post for the bombing range in the fields beyond. This is the road to 8a Petrol Installation Aviation (48,000 Gals) [9565/41]. 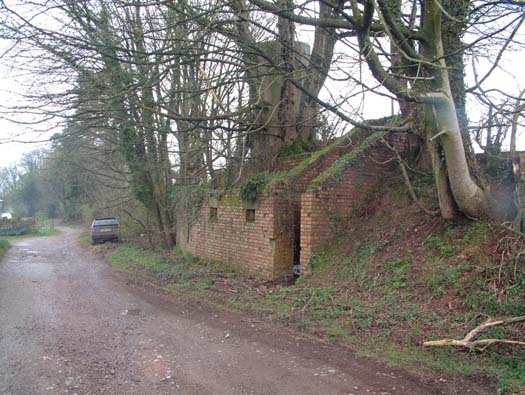 Pillbox to the right and a defence position with a Motley Stalk mounting. Plan of the defence position. Petrol Installation Aviation from an air photo. Pillbox and a quadrant post for the bombing range. Machine gun embrasure this one was not fitted with a steel shutter. Motley were an innovative manufacturer of machine gun mountings. A Motley Stalk machine gun mounting the type that may have been used here. 8a Petrol Installation Aviation (48,000 Gals) [9565/41]. Petrol Installation Aviation from the air. Bedford QL Bowser filling up a fighter. 231 Aircraft Pen [FCW 4513]. This is the right rear defence of the pen. An angled defending wall. You have to enter from the front left and a row of about nine rifle embrasures with shelves. This aircraft pen and the petrol instillation from the air. Plan of this aircraft fighter pen FCW 4513. The defence position on a very cold February day with two very intrepid airfield hunters. The view down to the left side. View through the embrasure showing the rifle positions with shelves for spare ammunition. Right side of the fighter pen. This is the area covered in the main picture. Spitfires snaking along a perimeter track. A lot of bricks have been knocked off. 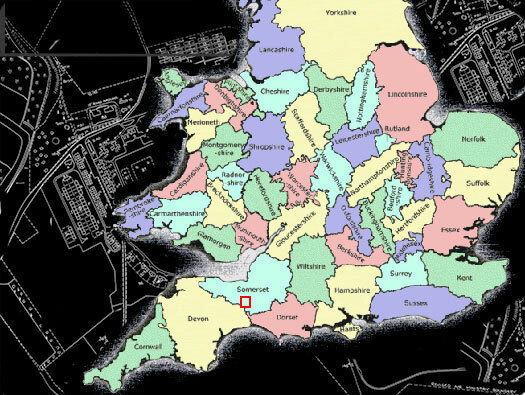 The area covered in the main picture. 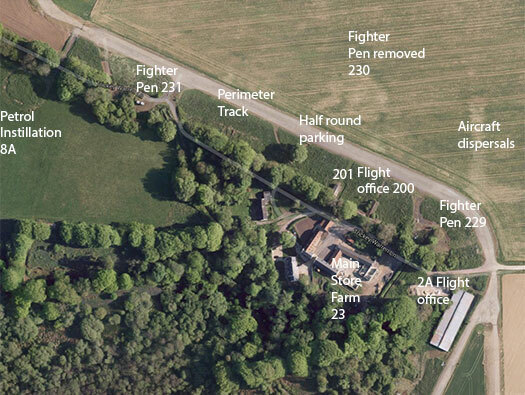 Aircraft fighter pen at RAF Harrowbeer very nicely cleaned up. RAF Harrowbeer was built around the same time to the same sort of specification. A link to RAF Harrowbeer. Track to 216 Blister Hanger [12512/41]. The track was wide enough for the wheels of the undercarriage and the hedge cut back to allow the wings to pass. Early Spitfire around the Battle of Britain time with a yellow diamond. If the diamond comes into contact with poisonous gas it changes colour. Site of the Blister hanger. Plan of the concrete base of a Blister hanger. Its is how you may find the remains of a base on an airfield. Over Blister at RAF Overton, now removed. The white concrete was the threshold of the Blister hangar [1251/41]. I have added some black lines to show how it may have looked. A fitting for the base of the Blister hanger, two large steel pegs set into a concrete base. Passing through here and just around the bend an Air-raid shelter. I believe an earlier type of air-raid shelter. Yellow is the site of the air-raid shelter. Inside with strait sides and flat roof. This is situated on the farm track. Flight offices and a small lay-by. This could be for flight vehicles to keep them off the perimeter track. I would like to know what these are for?? A pick up, standard RAF utility. Busy area here it had three fighter pens, flight huts, petrol storage and another suet to the south. 616sqn arrived with Spitfire VII and re-equipped with a brand new revolutionary aeroplane, the Gloucester Meteor twin jet. Just what a fighter pilot needs after flying. How it does look inside now. D-Day and Culmhead became its busiest time. Spitfires and Seafires were constantly shuttling to and fro probably some were Fleet Air Arm Seafires. These spotted for the battle ships shooting inland. HMS Roberts monitor firing on D-day..
HMS Rodney firing on Caen. Type ''B'' is the larger type for a fighter bomber a Bristol Blenheim. 229 the third Fighter Pen in the group. When I first saw this pen it was in pretty good condition but that was back in 2000. 229 the third Pen in the group. 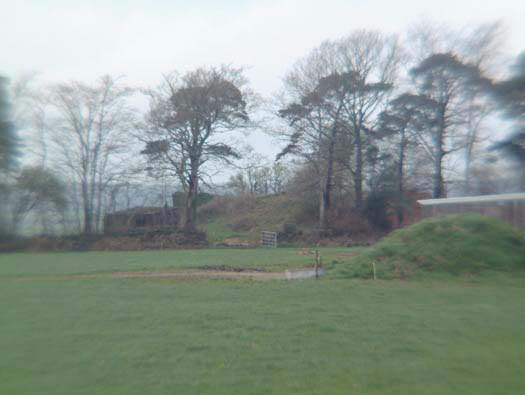 The rifle defence of the front of the fighter pen. 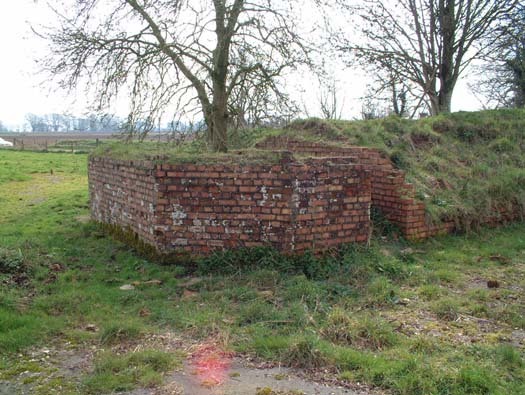 The rifle positions but the top bricks have been removed. 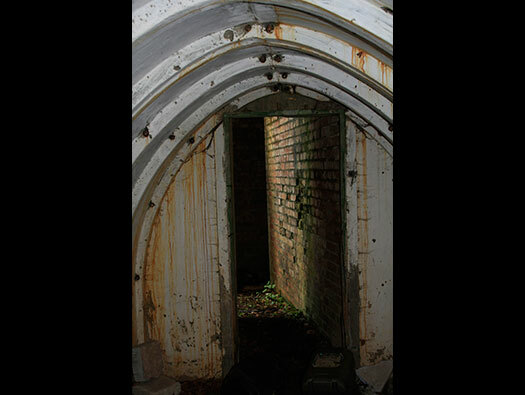 Rear angled defence wall and exit from a Stanton air-raid shelter. Stanton shelter in the middle. 2a Squadron office hut in Nissen. Built in tin a 24ft Nissen hut. Now removed. We now start on the S/W side. This area has three fighter pens for a flight of six aircraft, a flight office, latrine and a Blister hangar. 199 Flight office in Temporary Brick. There was also a static water tank here somewhere. Replace the roof and the windows and this building could last a long time. ''IF''. Some old and some quite new electrics. On the end of the latrine hut with the words ''CONSERVE DOPE''. The second fighter pen and the rear. 228 Type B FCW4513 fighter pen. Type B FCW4513 fighter pen. 226 the last fighter pen in this group. This one is in a very good condition. These fighter pen defences could also be used by the RAF ground staff who would have kept their rifles probably inside the air-raid shelter and be able to use them at a moments notice. Concrete base under an iron stove. Rifle trench at the front of the pen. 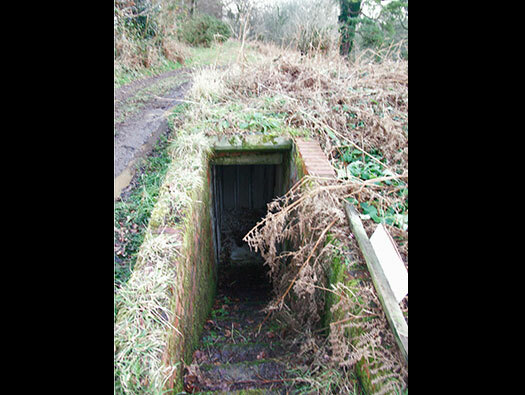 The fighter pens entrance to the air-raid shelter. Each side of a pen had access to the shelter. 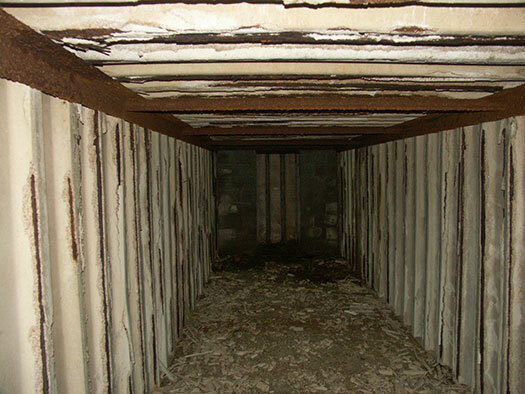 Stanton air raid shelter inside the pen. 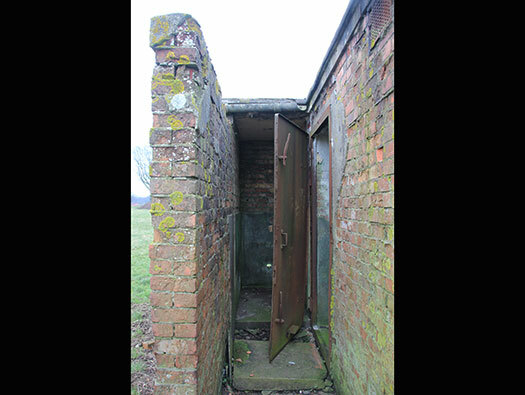 Stanton was a standard air-raid shelter used by the RAF on nearly all RAF stations. Parts of a Stanton shelter. Looking down on the exit from the pen to the rear. Light switch in the entrance. Rear defence of the fighter pen. A very large rifle brick trench. Plan showing the brick rifle trench. 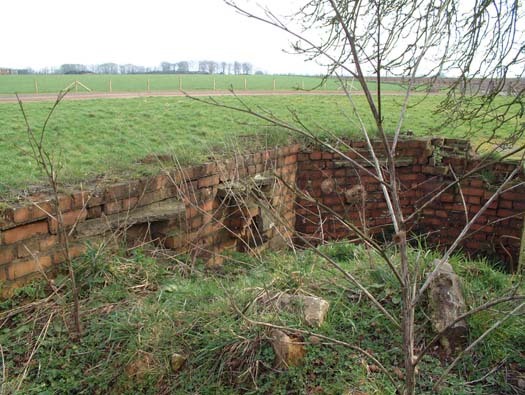 Actually this is a German brick rifle trench but it looks very much like the RAF design. Looking into the rifle trench. 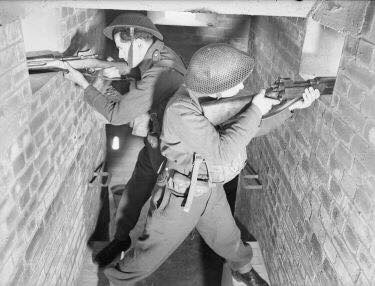 British soldiers in a double sided rifle trench. Fighter pen to perimeter track. This is where many a fighter started, warmed up and pulled out onto the perimeter track. 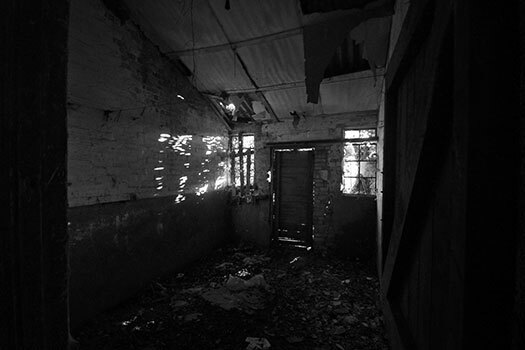 Heavy canvas curtains were used instead of doors to close off the the front and rear, also camouflage nets were used to cover the shadows made by the entrances, as they can be seen easily from the air. Blister with curtains each end. Behind and in the hedge is this gun pit. Plan of the gun pit. Base to place a gun on. Could have been a Vickers machine gun. Blacker Bombarder spigot mortar another weapon that may have been used here. Helped by the open emplacement to its left and with another pillbox (now destroyed), these defences covered this quarter of the airfield. Plan of the pillboxes here. Machine gun embrasure covering the airfield against paratroops. Two rifle slits covering the outside of the airfield. One complete flight area less one Blister hangar, should be a living museum. This corner 1943 air photo. Perimeter track extension going up towards the cannon butts..
18 Machine gun test butts [16461/41]. 27 Machine gun range [1471/41]. Four fighter frying pan style dispersals. Here was a cannon test butts for fighter aircraft to align their cannons/machine guns to converge at a set range. Then behind is a standard RAF rifle/machine gun butts. How it looked from the air. 18 Aircraft Machine Gun Test Butts [16461/41]. I took this picture a long time ago. Butts at RAF Charmy Down giving an idea of what they may have looked like. The two huts were the armourer hut and the target store. 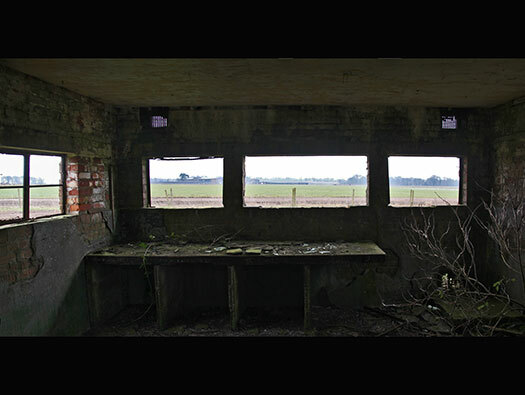 This is where airmen could shoot their .303 Lee Enfield rifles and armourers could test aircraft defensive machine guns as in a Lysanders rear gun, or a Blenheim's defence guns. Two huts each side connected by a rear wall and an overhanging roof to shoot from. The two huts were the armourers hut and the paper target store. Plan of an RAF rifle range. Continuing along the perimeter track going north. The only remaining building on the north east side. What was a high bank removed to make way for an airfield.